I cannot believe that it’s the end of October already. Halloween is just around the corner, but I’m not dressing up this year. I keep meaning to get all crafty and make costumes, but time always runs away from me. 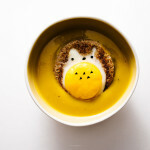 Instead I’ve been busy dressing up my food as Totoro. Totoro doesn’t really translate well into soup, but it’s officially soup season! All I want to do is cozy up with a big bowl (or mug) of soup and hang out on the couch and watch the rain – or maybe continue binge-watching Downton Abbey. 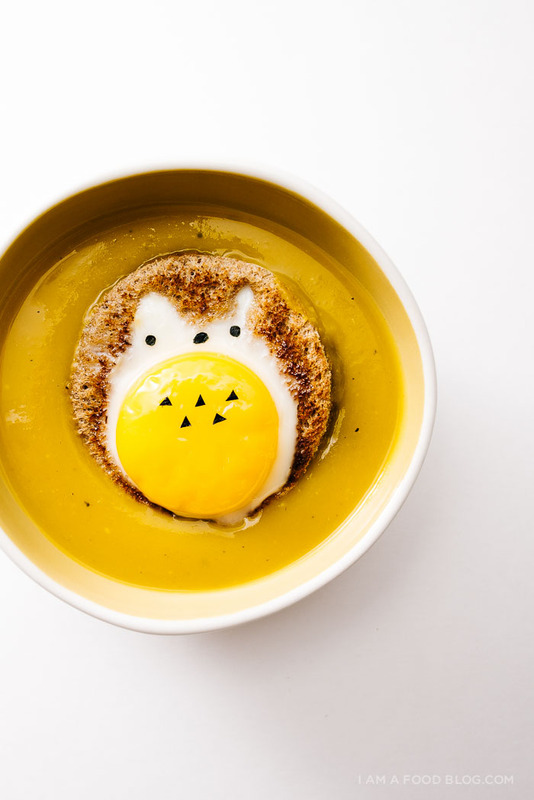 Seeing as I couldn’t figure out a way to make soup Totoro-shaped, I settled for floating a egg Totoro-in-a-hole with a yellow yolk belly on a sea of kabocha goodness. 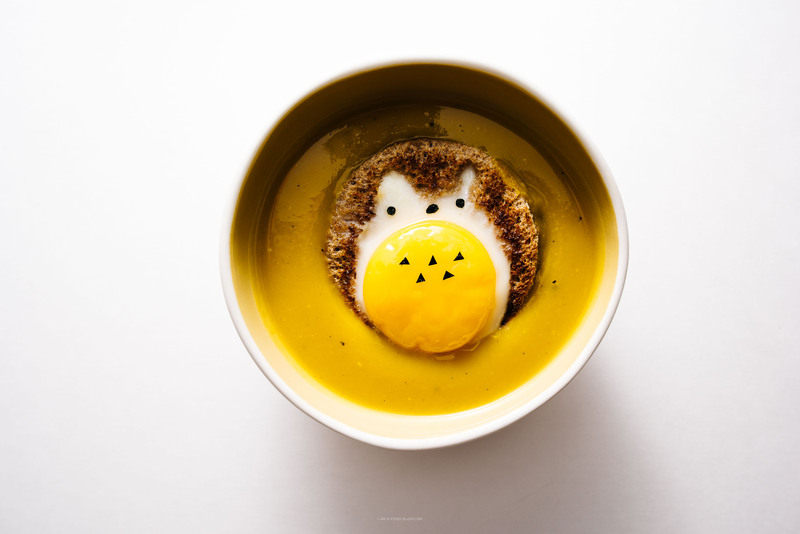 Even if you don’t make the Totoro-in-a-hole egg toasts that adorn this cute and colorful bowl, I hope you’ll give the soup a try. Kabocha is my absolute favorite of the squash family. It has a heartiness and sweetness that I really enjoy. It’s delicious when it’s roasted, but if you don’t want to wait the hour or so it takes to roast, you can whip up this soup for a quick kabocha fix. This soup is super hearty and fall flavored with ginger for a bit of spice and shallots for an extra bit of sweetness. It’s simple, easy, creamy and incredibly satisfying. I used a regular blender to blend it all up, but you can use a stick blender if you have one on hand. I really like the creaminess of blended soups, especially when they don’t actually have cream in them. Hope you guys are getting your soup on! Please check out Lyndsay’s My Neighbor Totoro Cake Tutorial and Cindy’s Black Sesame Totoro shortbreads. I’ll be rounding up all the Totoro posts on Friday, so be sure to check back! In a pot, melt the butter over medium heat. Add the shallots, garlic, and ginger and cook until slightly soft but not brown, about 2-3 minutes. Add the kabocha and the stock and bring up to a gentle simmer. 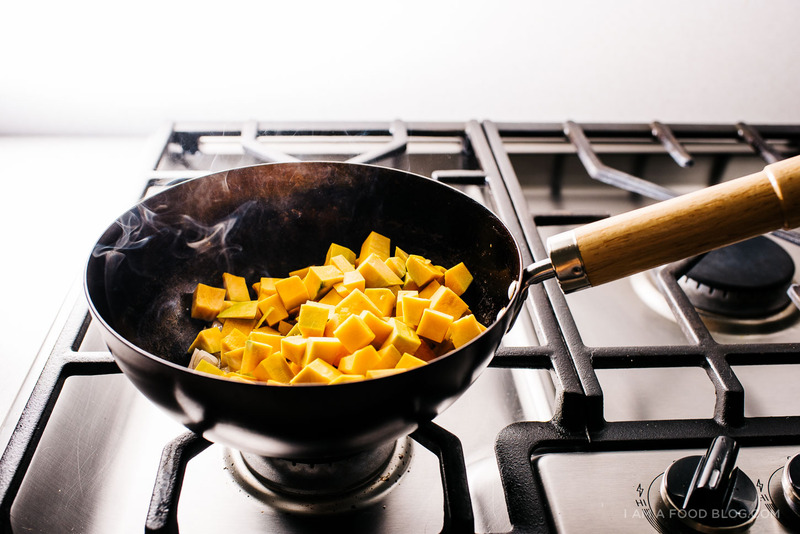 Simmer, on medium until the squash is tender, 20-30 minutes, depending on the size of your kabocha cubes. When tender, use a stick blender and blend until smooth. Or, carefully transfer to a blender and blend until smooth. Taste and season with salt and freshly ground pepper. 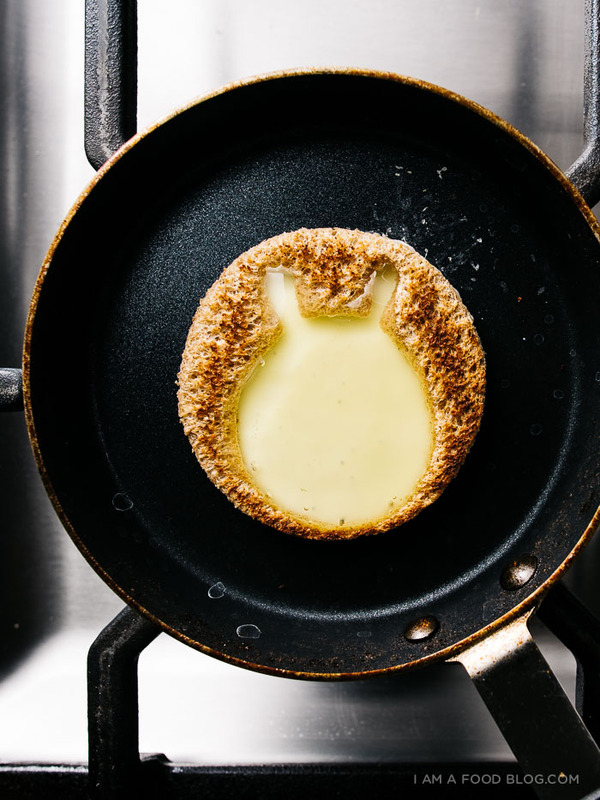 Enjoy hot plain or with a Totoro-egg-in-a-hole. Use a cookie cutter and cut out Totoro. 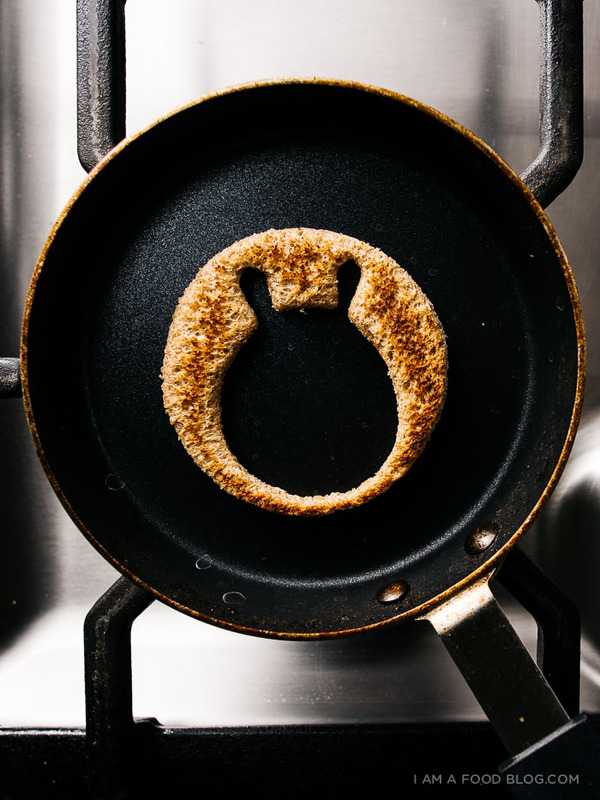 Place a bit of butter in a non-stick pan over medium heat and melt. Toast one side of the bread, add a bit more butter to the pan, and toast the other side. 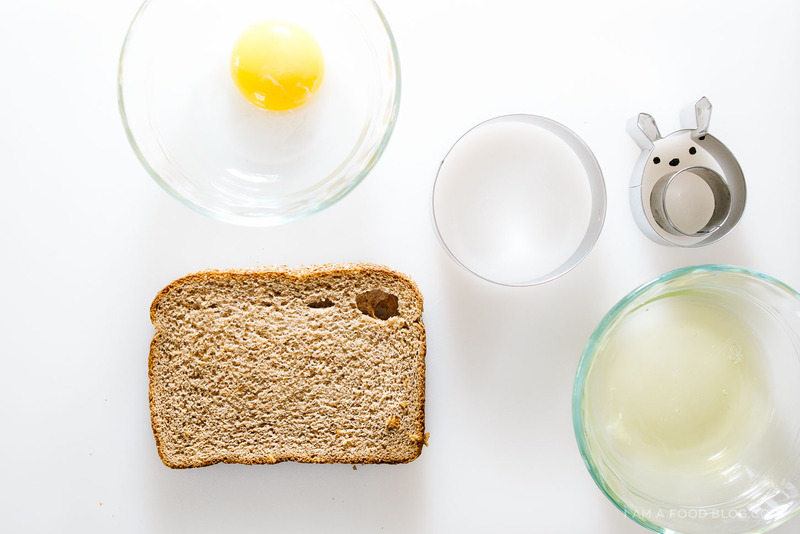 Carefully pour the egg white in the hole and let set slightly. Add the yolk where Totoro’s belly should be. 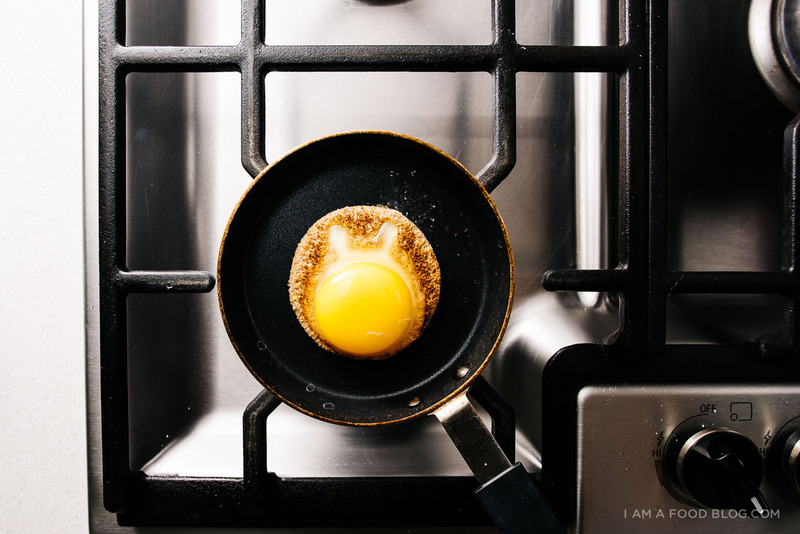 Cook on medium-low, covered (use a glass lid if you have one so you can see) until the egg is done to your liking. Remove, add Totoro’s features and enjoy! It’s #totoroweek! Be sure to check out all my other posts of food dressed up as Totoro, Lyndsay’s Totoro cake tutorial, and Cindy’s Totoro Black Sesame Shortbreads! I’ll be posting a round-up of Totoro goodness on Friday, so hop on back here for that! this soup sounds so tasty and warming, and i’m always down for squash! might i say that you are a teensy bit crazy (or very dedicated) to do all those teeny tiny seaweed decorations placed just so?!?! 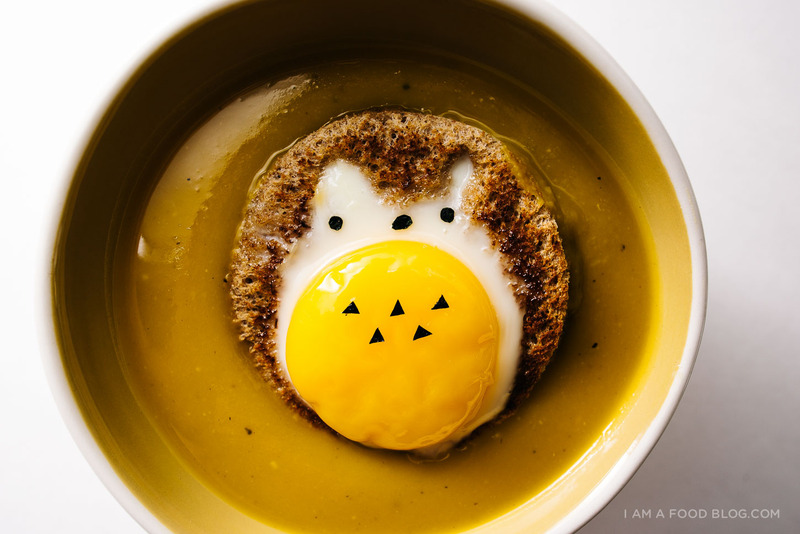 The Totoro Egg in a Hole Toast has to be one of the cutest foodie creations I’ve ever seen! Is this even real? Lady you just know how to create awesomeness! And I’m with you on kabocha squash — I actually have one sitting on my counter right now, destined to become a creamy (without cream) soup! Love the Totoro egg in a frame! Where did you get the Totoro cookie cutter?